The Czechs are on their way to the semi-finals for the first time since Turin after edging the USA in a shootout. Petr Koukal settled it after a 2-2 tie. Four years ago these teams met at this stage in Sochi, and the USA's NHL-powered roster eased to a comfortable 5-2 victory. In Korea, things were very different: two rosters dominated by European-based players battled each other to a standstill before Petr Koukal won it for the Czechs in a shootout. Koukal was the only player to find the net after the teams tied 2-2 over 70 minutes of hockey, claiming the game-winner here after also scoring in his country's shootout success over Canada in the group phase. At the other end, goalie Pavel Francouz denied all five American attempts and secured the victory when he got behind Bobby Butler's final shot for the USA. "I just try to stick with the guy," Francouz said. "I don't make any moves and wait for the shot or the deke. I had a little luck there too, so I'm happy that we won." Watching on from the bench, defenceman Vojtech Mozik described is as unbelievable when Francouz closed out Butler to secure the victory. "It's something you dream of, it always is," he said. "You just want to keep moving through the tournament and here we are in the semi-finals. It's an unbelievable feeling, and we're so happy." 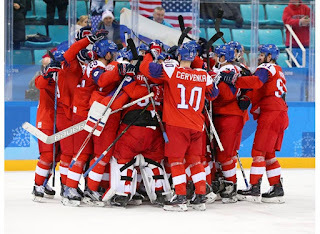 It was also a revenge win for the Czechs, stopped at this stage four years ago by the Americans, and took the team to the final four for the first time since 2006. Coincidentally, that was the last time the USA failed to reach the medal games. Ryan Donato admitted that the loss - and especially the manner of it - was hard to take. "It's tough to watch everything that you've worked hard for come down to one goal in a shootout but that's hockey and at the end of the day hopefully we'll learn from our experiences and come back better hockey players." Goalie Ryan Zapolski, at the opposite end of his career from the college player Donato, was more philosophical after a tight loss. 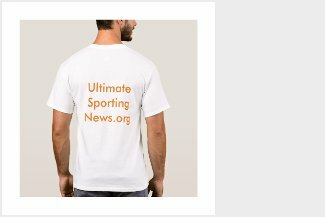 "Being at the Games was an amazing experience for all of us and something we should all be really proud of," he said. "I think maybe in 10, 15 years when we're done playing this is something we'll look back on and say it's probably the best moment of our careers." But it was never plain sailing for the Czechs. They had to come from behind before tying 2-2 in regulation, and might have lost it all in the closing minutes when Brian O'Neill rattled Francouz's crossbar with seconds left to play. However, Josef Jandac's team has plenty of experience in tight games here - a 2-1 victory over Korea, that shoot-out against the Canadians and a 4-1 margin over Switzerland that was bolstered by two empty-net goals - and played with great composure, even after going behind early on. Traktor Chelyabinsk netminder Francouz added: "It was hard for us when they tied the game. We had a lot of pressure in that second period, they just had one breakaway and scored on us. We just kept working, we had some luck in the end because they hit the bar, but that's hockey." The USA’s Terry-Donato axis did the damage for the opening goal. The duo, both still playing college hockey, got to work around the left-hand circle, with Troy Terry feeding back to Ryan Donato. His shot flashed through a screen inadvertently created by the Czech duo of Roman Horak and Ondrej Vitasek and beat the unsighted Pavel Francouz. That rocked the Czechs back after an early, needless U.S. penalty had given Josef Jandac’s team a platform for its offence. But gradually the pressure began to build in front of Ryan Zapolski in the American net, with Roman Cervenka finding a couple of opportunities to menace. His first chance came after the defence clumsily turned over the puck to Tomas Mertl, and he fed Cervenka for a shot that Zapolski pushed away. Soon after, Cervenka had a second shooting chance, but this time the goalie saw it all the way and made a comfortable glove save. That flurry lifted the Czechs, and the tying goal was not long in coming. Jan Kovar won a face-off on the left, fed the puck to Jan Kolar at the point. His shot crashed in off the far post, with Zapolski unable to respond. The Amur Khabarovsk D-man paid tribute to his team's resilience in the competition so far. "It's like every game we get into a difficult situation, but we find a way to win," he said. "But, yes, we were nervous. Every game is so tight, and it's always about just one goal. But we still believed in ourselves." Tempers spilled over at the end of the frame. John McCarthy was assessed for a boarding call after an incident in the corner, and players from both teams converged to debate the matter further. The subsequent power play at the start of the second period set the tone for what was to follow- plenty of Czech pressure, and limited opportunities for the Americans. That paid off for the Czechs when a Martin Ruzicka effort was only cleared as far as Tomas Kundratek on the point. The Torpedo Nizhni Novgorod defenceman punched a slap shot through a crowded slot to give his team the lead for the first time in the game as Tomas Mertl made a nuisance of himself in front of Zapolski. And it seemed that the Americans, limited to a solitary shot on goal through 10 minutes of the frame, would face further problems when Mark Arcobello was sent to the box. Instead, a short-handed goal drew the USA level. It started with a wild Tomas Repik shot flashing well over the bar before the puck bounced kindly for Brian O’Neill. He produced a defence-splitting pass from blue line to blue line to release Jim Slater and, with the Czech D-men scrambling to get back, the Swiss-based forward advanced to zing a wrist shot through the gap between Francouz’s pad and blocker. That was the end of the scoring in regulation, but the Americans were millimetres away from victory in the 58th minute when Brian O'Neill rushed down the left and rattled the crossbar before seeing the puck bounce just beyond Broc Little as he looked for a rebound. The Czechs could not find such a clear opening, although Lukas Radil drew a good pad save from Zapolski and a late, late Michal Birner raid set nerves jangling around the USA net. Overtime began with the USA on a power play, but the team failed to get a shot at Francouz as the Czech PK ran down the clock. Back at four-on-four play, the clearest shooting lanes opened up for D-men, with Bobby Sanguinetti firing wide when well-placed for the USA before Zapolski got behind a solid effort from Jakub Nakladal at the other end. But there would be no winner until Koukal wrapped it up in the shoot-out.